When I first saw the images of the LG 25UM57 my jaw hit the desk. In a world where 16:9 aspect ratio has become the norm for monitors, having successfully overthrown the 4:3 monitors many moons ago, and now a new ratio steps up to do battle; 21:9! The first thing you notice when you take it out the box is the size, this is no ordinary 25″ monitor, the monitor width was the same as my standard 27″ monitor. Being faced with an ultra wide desktop for the first time, it takes a moment or two to digest just how much extra space you have to play with. I found that outside of games, my productivity increased as snapping windows side by side no longer felt cramped. Most programs and websites still had enough workable space on them to feel “normal”, like I had the windows open full on a screen each. When loading into a game for the first time, I didn’t know what to expect. First thing you notice though is how much more you can see. With games that support the full 2560×1080 resolution, they look crystal clear and smooth. Despite only having a 60HZ refresh rate, the game looks almost as smooth as it would on a 120hz or 144hz monitor, for a fraction of the cost. Ultra wide resolution could give you an edge – Would you have heard the guy on the left? Games that I found worked really well with this monitor, and gave you extra visibility were Counter Strike:Global Offensive and League of Legends, but there is a whole list of games which LG have tested the screen with so you can see if you can get more out of your favorite game. 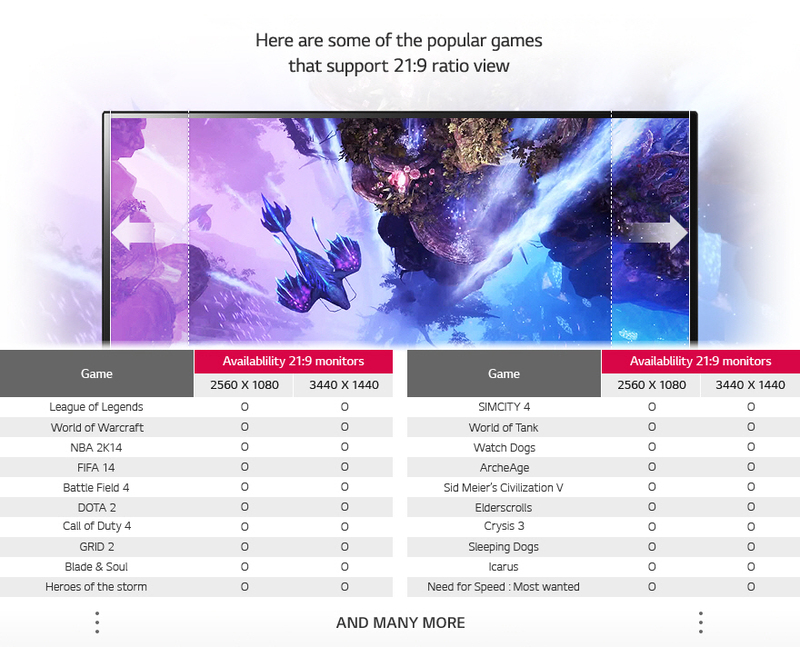 Does your favorite game support LG’s super resolution? The one issue I ran into with this monitor is with games that don’t support the native resolution. This could cause some strange side effects, but nothing which made the game unplayable. The side effects would mainly be the game loading with black bars on the left and right where the supported resolution would end, or stretch resolution to fill the whole screen making it look a little out of proportion. Every issue I ran into though was easily fixed by changing the game or monitor settings. 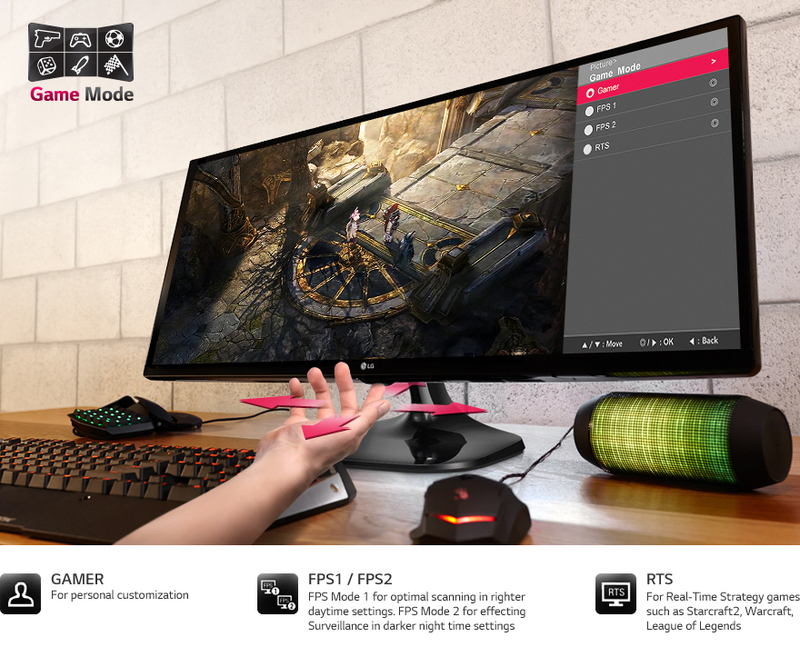 LG use state of the art technology in their monitors to help improve your game, and your overall gaming experience. Black Stablizer automatically will make the darker area of your games lighter automatically giving you a visibility edge on your opponents. 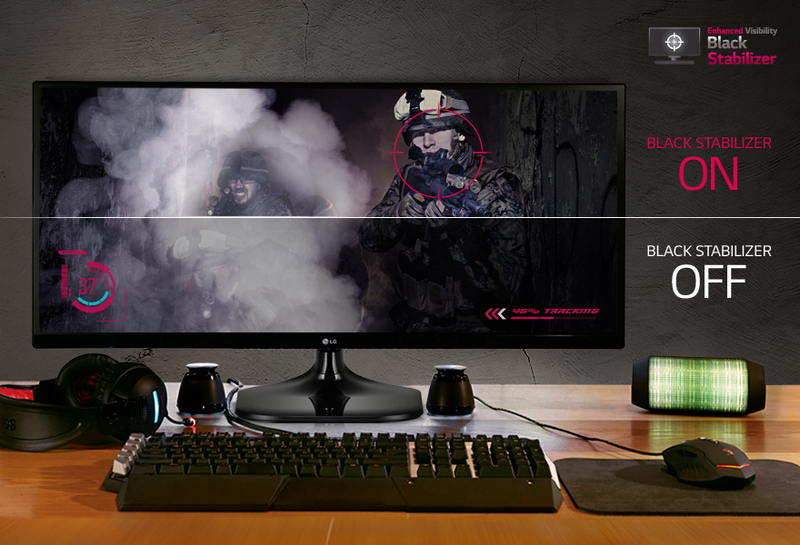 With preset gamemodes built into the monitor, you can make sure you are always using the right setting for your game. These predefined settings have been tested on a number of titles across genres to give you the best possible picture and experience. For me, this is a great monitor. I have enjoyed using it for work and play. I have taken it to competitive events and had people question why I use this monitor and then find out they would actually consider using it too once they have seen it in action. For the competitive price of £155.99 on Overclockers I strongly recommend giving it a try for your next monitor.